Artists get asked a lot about inspiration, about source material. And then they get asked about process, about all those little steps in between prepping the paint and declaring a work the finished product. But there’s nothing quite like walking into a gallery without this information to get a little lost (and maybe a little dizzy) by jumping head-first into an artist’s unique vision. Hueman, aka Allison Torneros, is a street and fine artist working out of San Francisco. 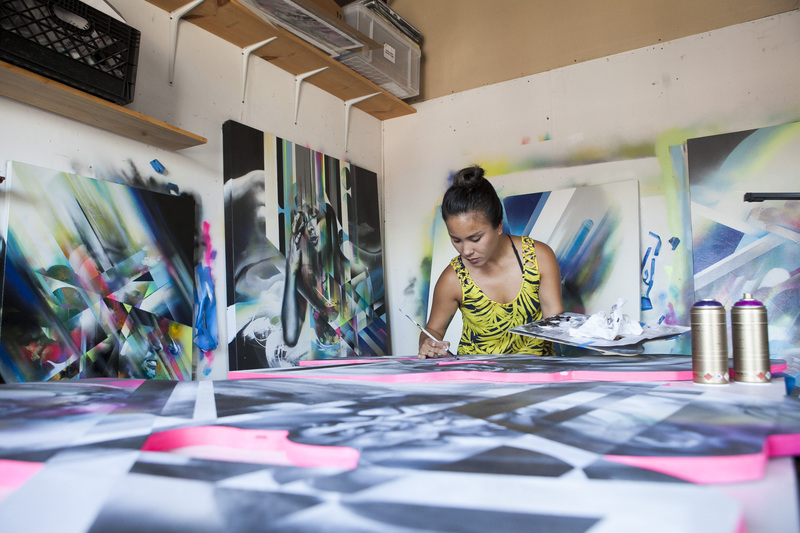 Her recent solo show, “Just One Moment,” includes more than 15 new pieces. 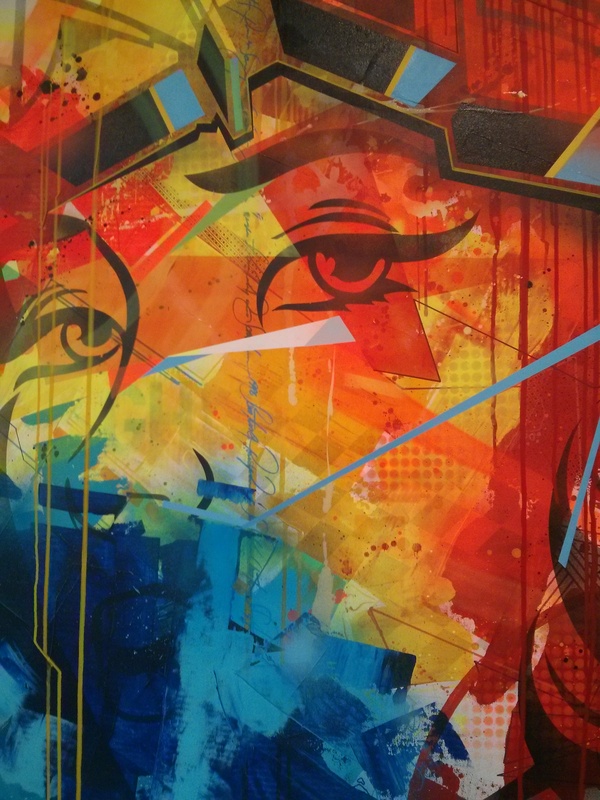 Much of Hueman’s work features vibrant colors, flowing lines and mysterious faces. 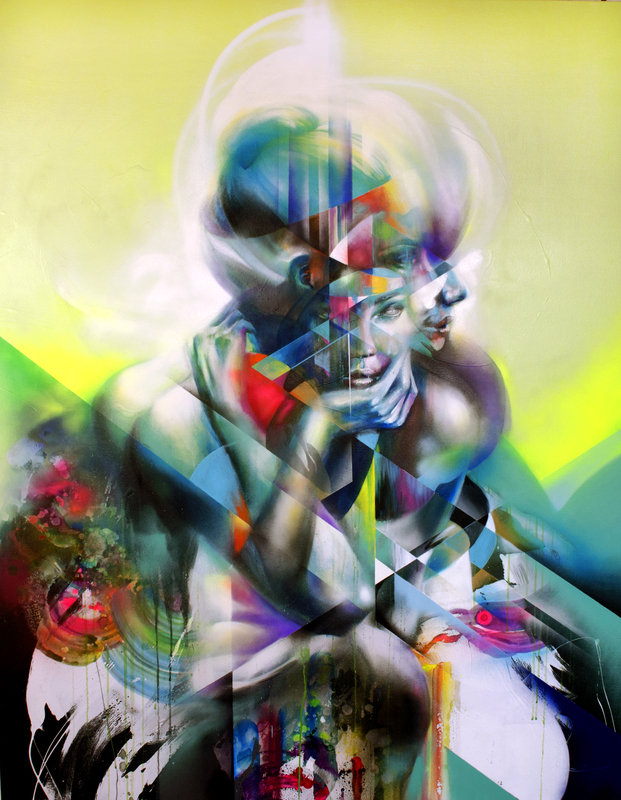 The works in the show are described as “a look into a singular moment in time, spliced, dissected, and manipulated through intersecting lines and planes.” Hueman often plays with perspective, asking that the viewer put together the pieces — or surrender to the work’s intertwined parts and get lost in their ordered chaos. 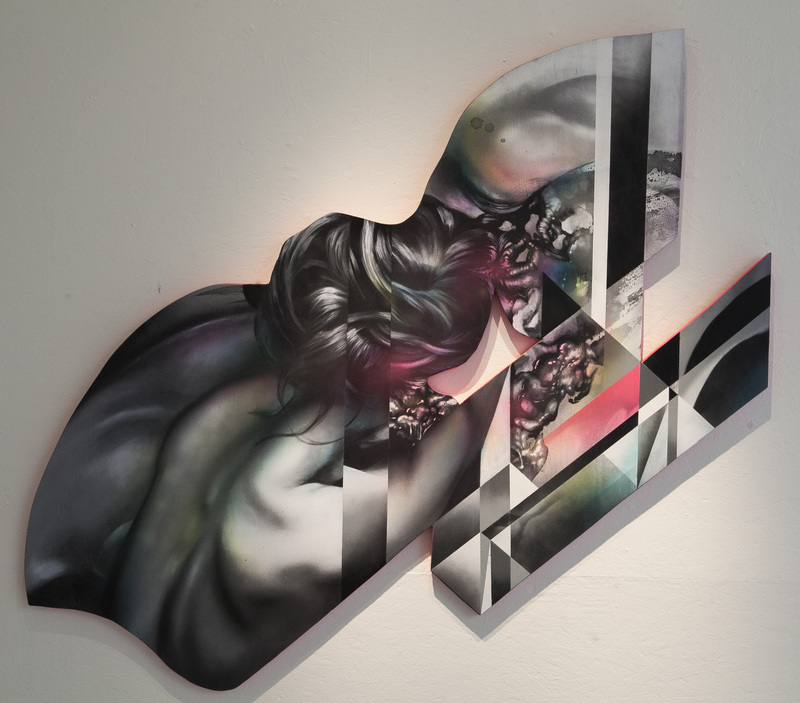 For this show, Hueman pushes that concept further by also manipulating the canvas. No longer a square surface, it also alters the expectations of the viewer. In some instances, the canvas echoes the movement of the work’s content; an edge mirrors the curve of a woman’s neck and back while sharp angles echo the angularity of strong lines. 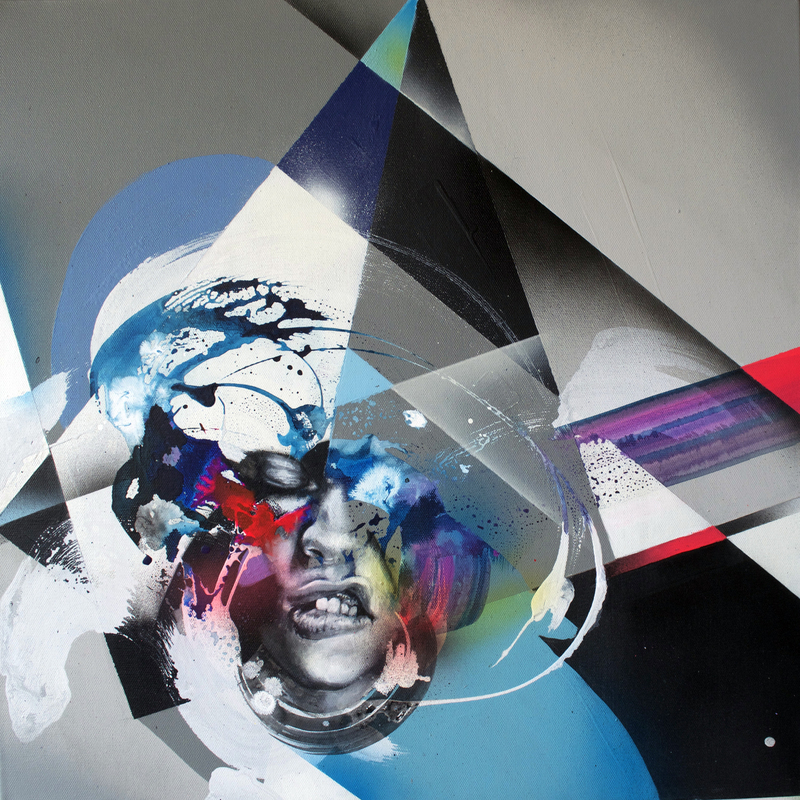 At this point, Hueman has already gained the viewers’ trust – and will continue to break it into gorgeous, dizzying pieces. 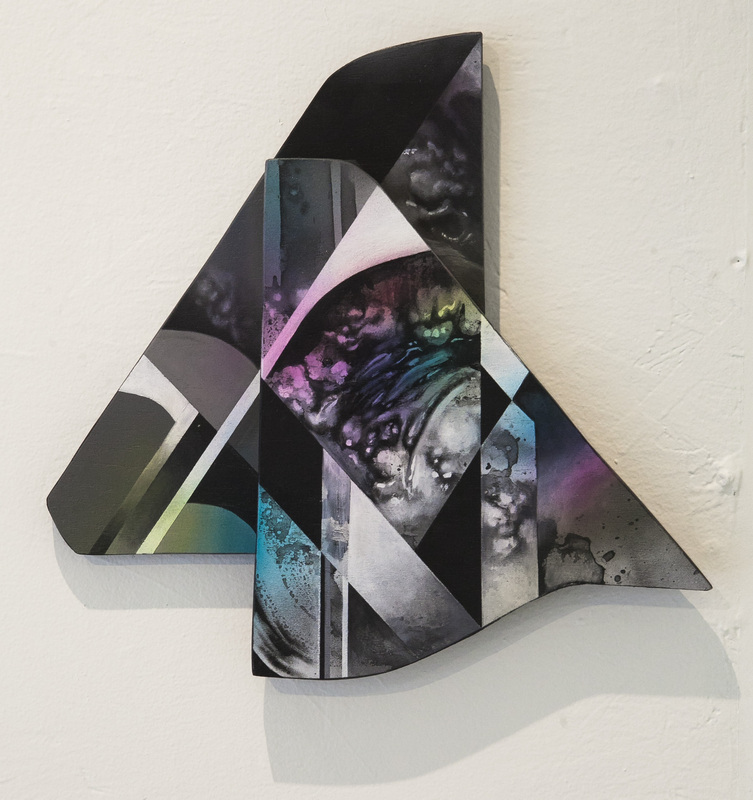 “Just One Moment” is on view at Mirus Gallery until October 10. Photos courtesy of Mirus gallery; final photo by Brock Brake for Mirus Gallery. As cars whizzed by and I wobbled over pavement cracks in my wedges (because it’s summer and I can’t wear them in San Francisco), a large face suddenly appeared in front of me. Well, actually, a sign describing The Springs first caught my eye. I walked towards the building and then noticed that the blue of the sky seemed to reflect off a mural on the wall depicting a face staring out into the distance. 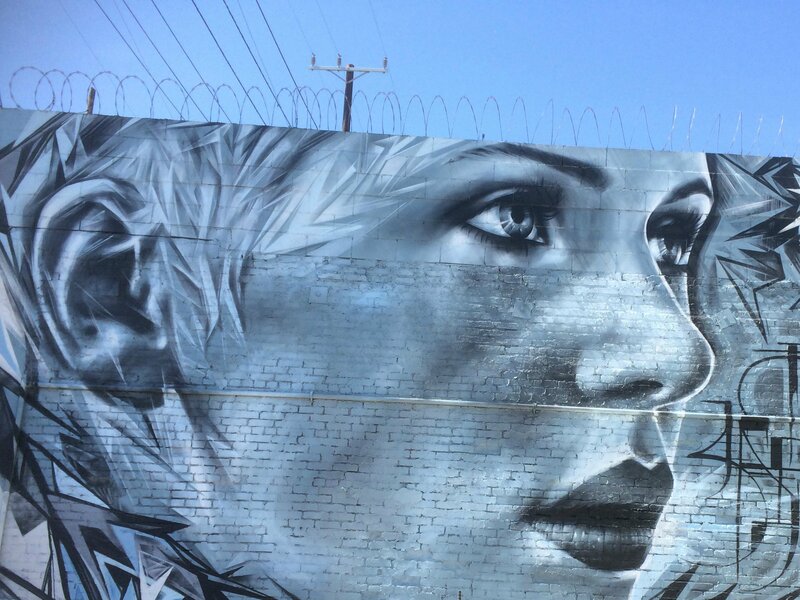 This is the work of Christina Angelina, an artist based in California — Venice to be exact, so you can spot plenty of her pieces throughout LA. 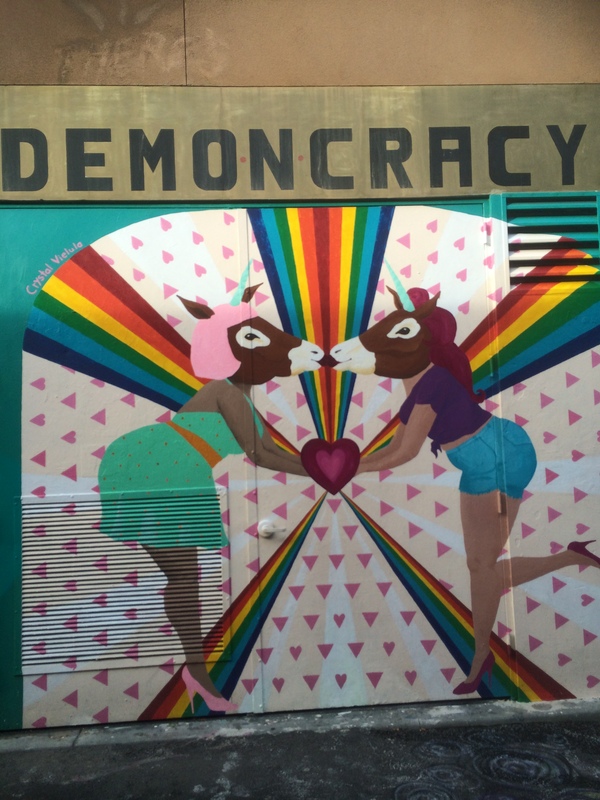 What I really loved about finding the piece on this particular day is the way that the LA environment played so beautifully with the colors in the mural. Something about the light blue against pops of white on the wall seemed so fitting with the tufts of cloud and bright hues in the sky. Overly romantic? Maybe. But that’s what Los Angeles does to you sometimes. The Springs — an adorable juice bar and cafe — asked Christina (nicknamed Starfighter) to paint a few walls inside and outside. When I wandered into the space, there was also an awesome pop-up shop from M Dot Design Studio. Christina has a knack for photorealistic faces. Her muted but eye-catching color palette has become her signature although she’ll also use grays and pops of bright color in other works. 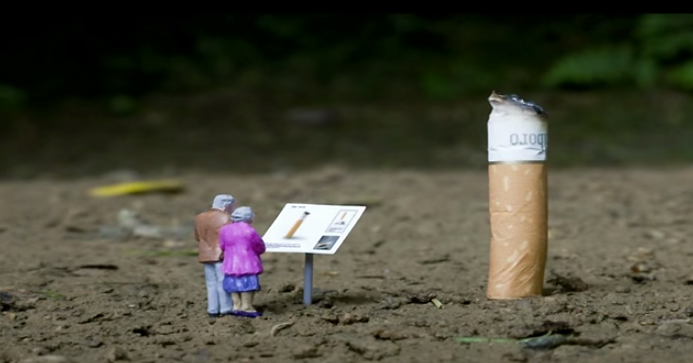 A lot of her figures seem to have untold stories, secrets they’re hiding. Except the viewer doesn’t quite know what those secrets are — and maybe it’s better that way. New York City gives me a sensation that I can only explain as the prickly feeling you get when someone is about to tell you something. You’re ready to receive the message, excited because something tells you it will be a good one. When I arrived early on a Thursday morning, my body had no trouble adjusting to the jet lag. It also didn’t struggle with weaving itself through subways crowds or streets full of pedestrians. The only challenge: the glorious yet tiring heat. Luckily I had a couple of sightings to keep my mind off getting lost in the muggy streets while hauling my luggage. During a stroll on the High Line with a delicious People’s Pops popsicle in hand (Strawberry Basil), I came upon this piece. 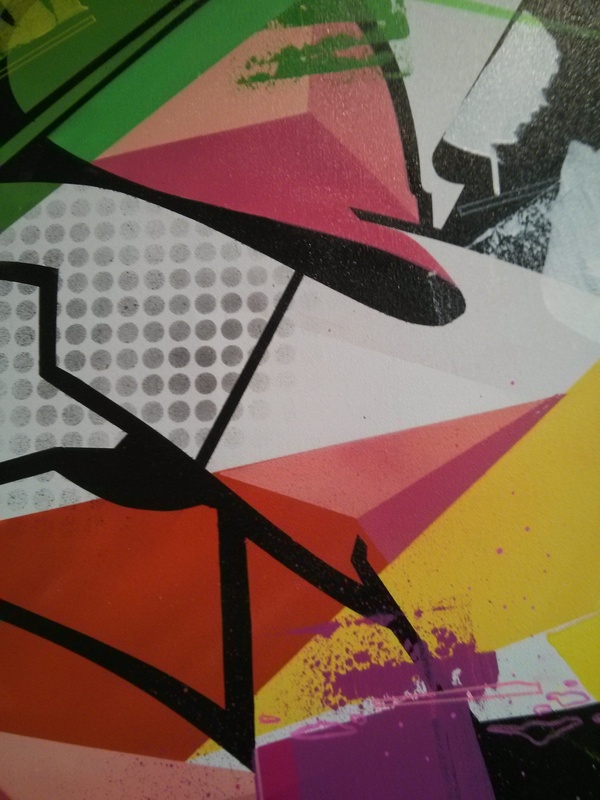 The bold style and signature tipped me off right away: it’s a piece by Eduardo Kobra, a Brazilian street artist. The mural makes its way into your field of vision when you walk the High Line. It’s a rare moment to see street art from higher up than the ground — you can almost envision yourself in the position of the artist himself. Street art, after all, is about height and perspective so seeing it from the ground sometimes doesn’t do the work enough justice. The patterns on the piece (those tights!) 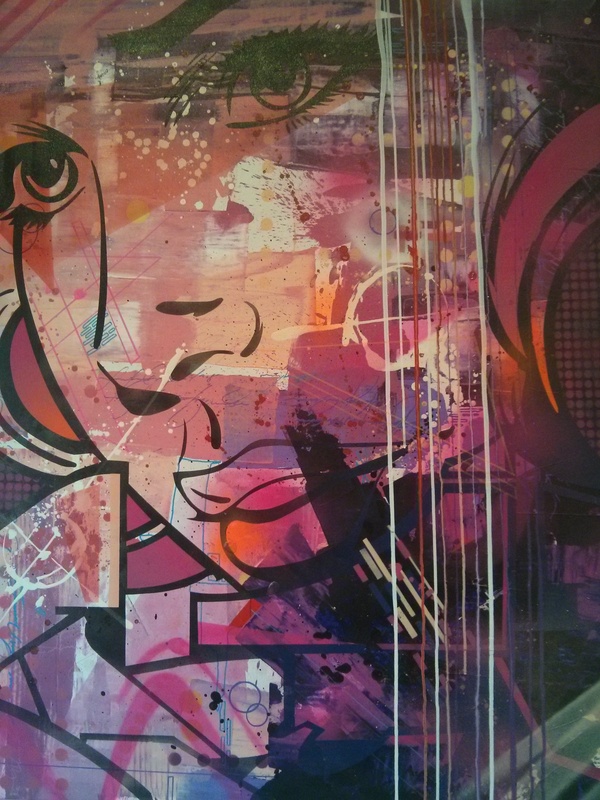 are fantastic and lend a super recognizable aesthetic to Kobra’s work. He’s depicted everyone from Dalí to Einstein is this signature style. It reminds of something between a colorful quilt and an explosion of bright pixels. Covered in these distinct colors, each scene and person seems to take on a different shape. I continued to my next adventure and my friend pointed out this Roy Lichtenstein piece in the subway station. 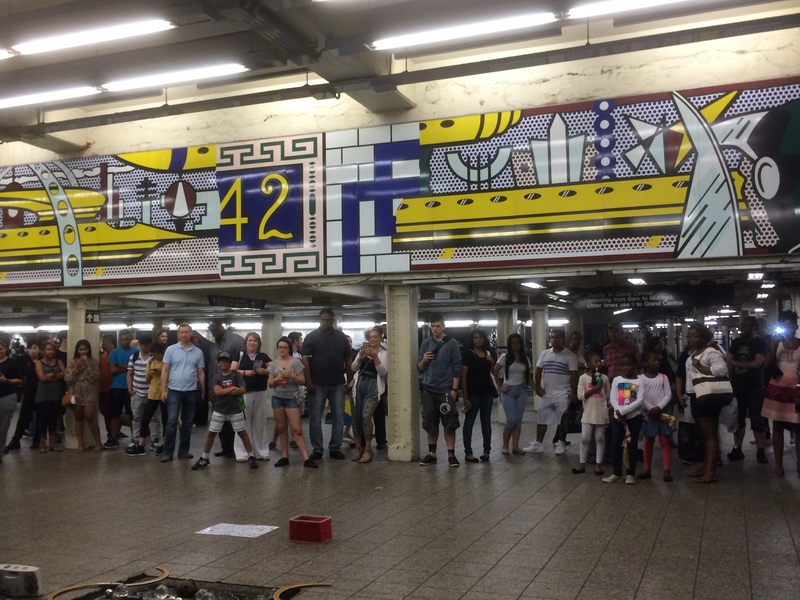 So while onlookers watched a subway performer I snapped a photo. The “Times Square Mural” is six feet tall and 53 feet long; amazingly, Lichtenstein completed it three years before his death. It’s got references to all kinds of cultural history, like the 1939 and 1964 world’s fairs. I am a big fan of Lichtenstein’s work but normally see his pieces at galleries or museums. Seeing one of his pieces in a public space gave it a different sort of magic, especially with a crowd standing underneath it. New York City’s past and present seemed to come together and I felt then and there that the city had a rich history I needed to know more about. Alas, my trip was only a couple of days. But I walked away with the feeling that I would be back again. And I KNOW there is plenty more street and public art to discover. 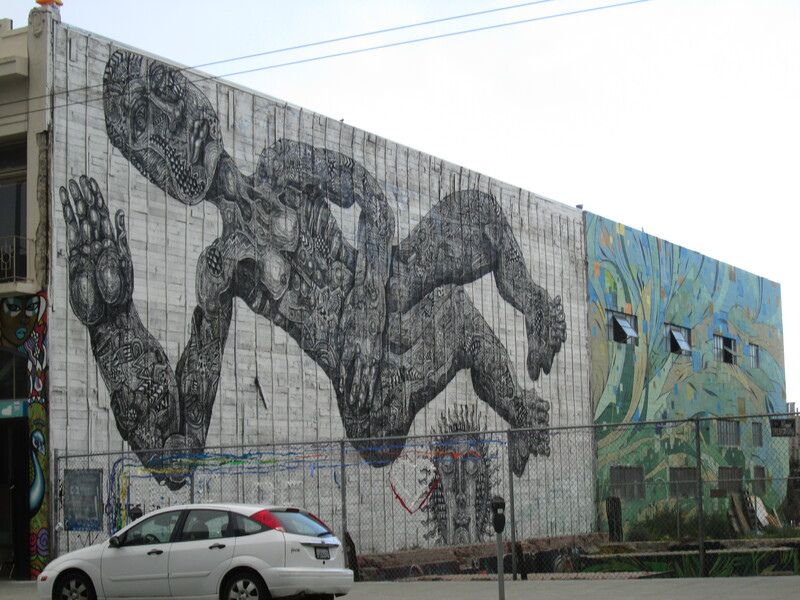 Zio Ziegler spotted in the Outer Sunset. Such a cool mix of color and pattern. In San Francisco, you better hold on when you get on the bus. The announcement over the speakers tells you so and a kind stranger might warn you, too but if you don’t heed those warnings you’ll learn your lesson soon enough. When the bus goes lurching forward, it makes even the most talented skaters and gymnasts (who else has great balance?) judge their abilities. Basically, you might go flying forward into the dashboard or head-first into someone’s groceries. But the magical part of riding public transportation here — at least from an LA native’s perspective — is how easily it can get you almost anywhere. So long as you hold on tight. 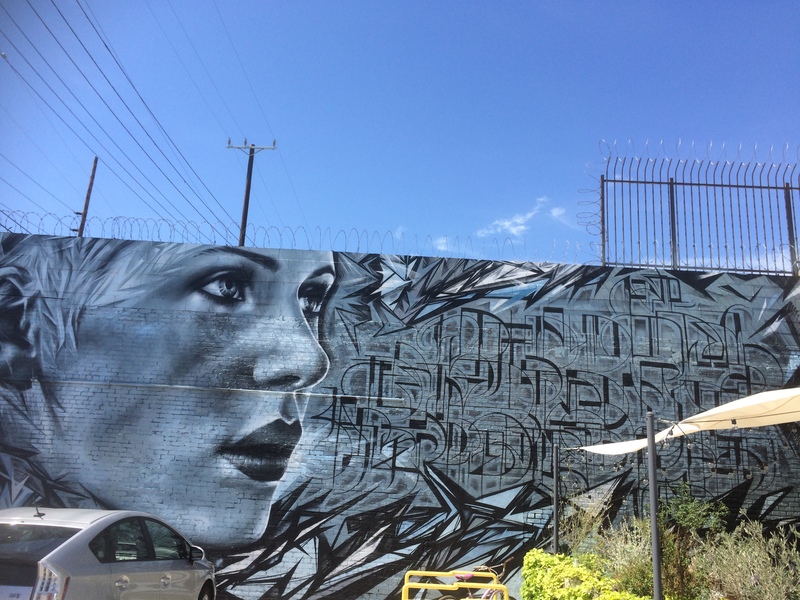 In LA, I stumbled upon street art while driving. But after two years of not driving, I realize the value of finding public art while stepping off the bus or just walking. 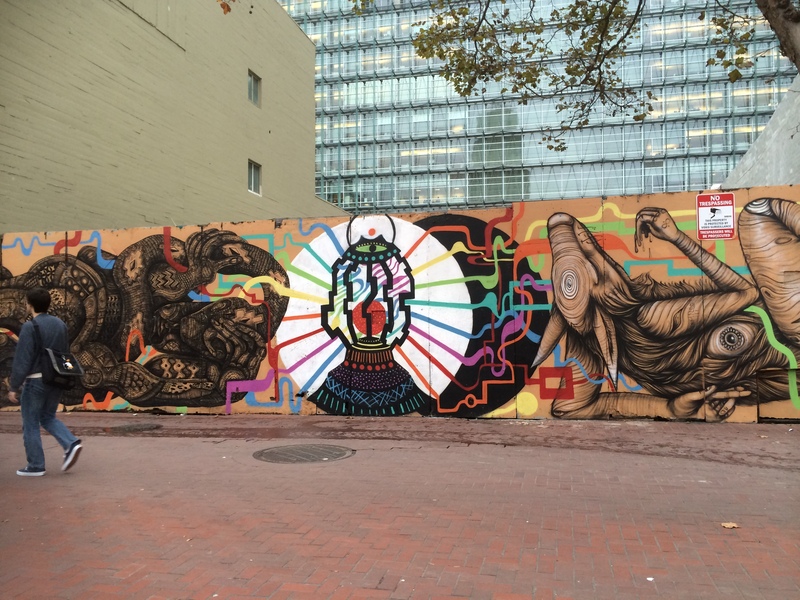 Nychos in the Tenderloin (or TenderNob as the locals call it). The word ‘gnarly’ comes to mind. 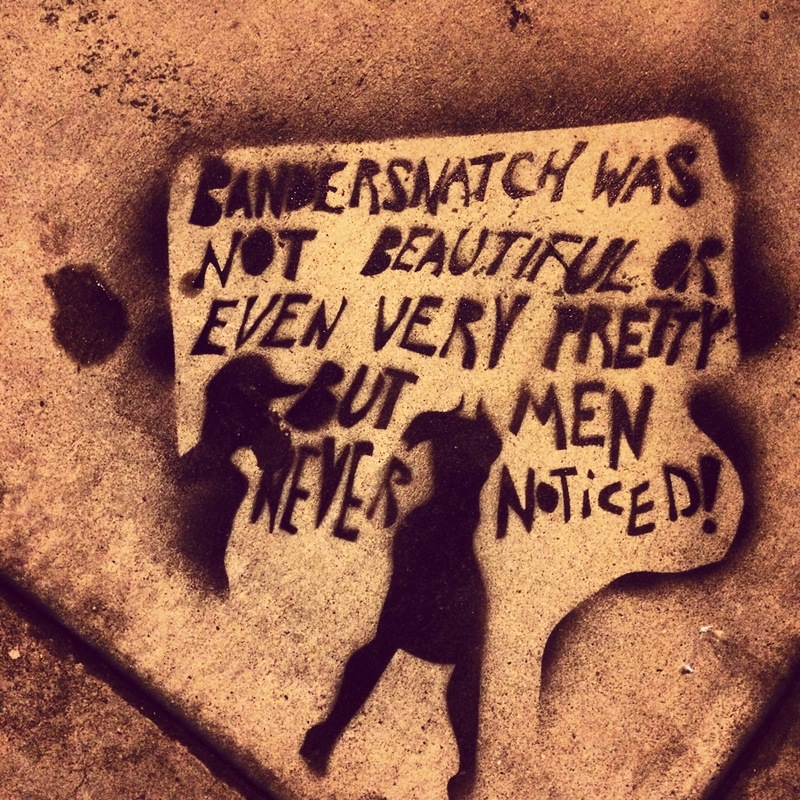 Clever Eclair Bandersnatch piece in the Mission. One of many awesome pieces in Clarion Alley in the mission. Artist unknown (any leads?). 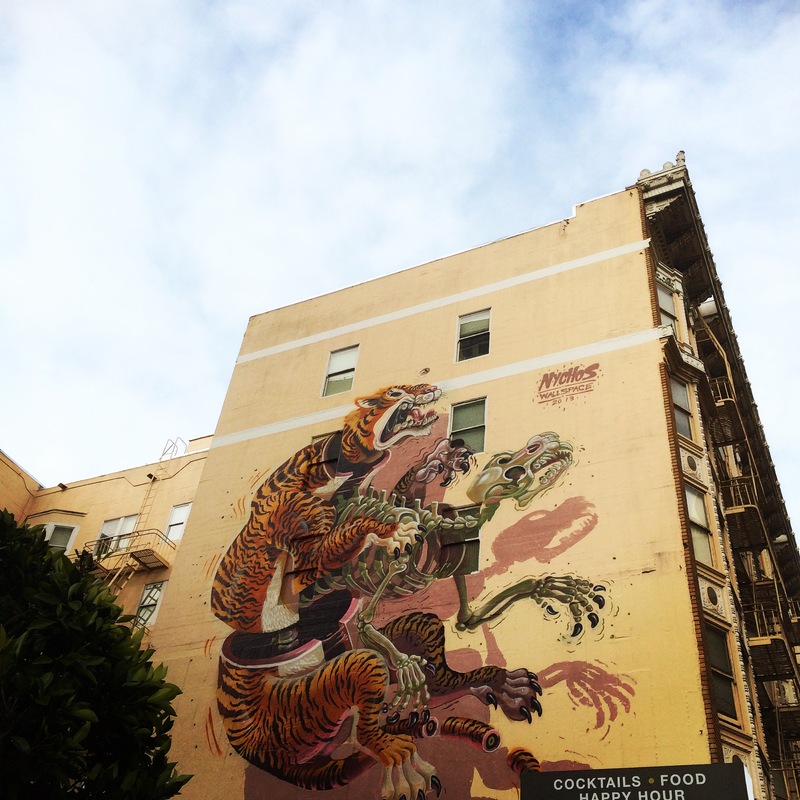 Awesome collaboration between Brett Flannigan, Zio Ziegler and Cannon Dill near downtown. It’s been a year since I moved to San Francisco! Compared to LA, this city is colder (duh). It’s much easier to get around without a car. Everyone on the street seems to walk faster, at least in Downtown. Oh, that’s the other thing – each neighborhood has it’s own personality. This city often feels like a crayon box – all the crayons might be right next to each other but they are definitely not the same color. Speaking of color, I recently got to check out “A Declaration of Color” at 1AMSF. 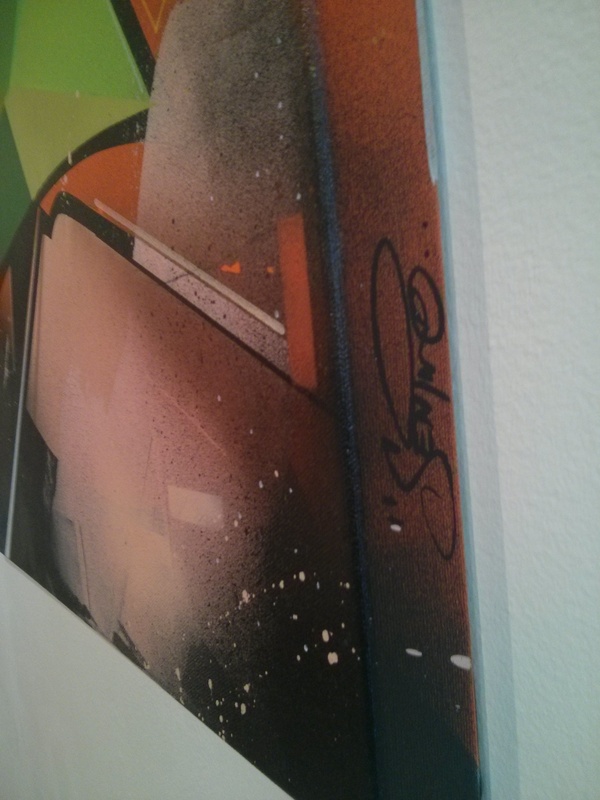 It’s a fantastic solo show by the street artist Sen2. 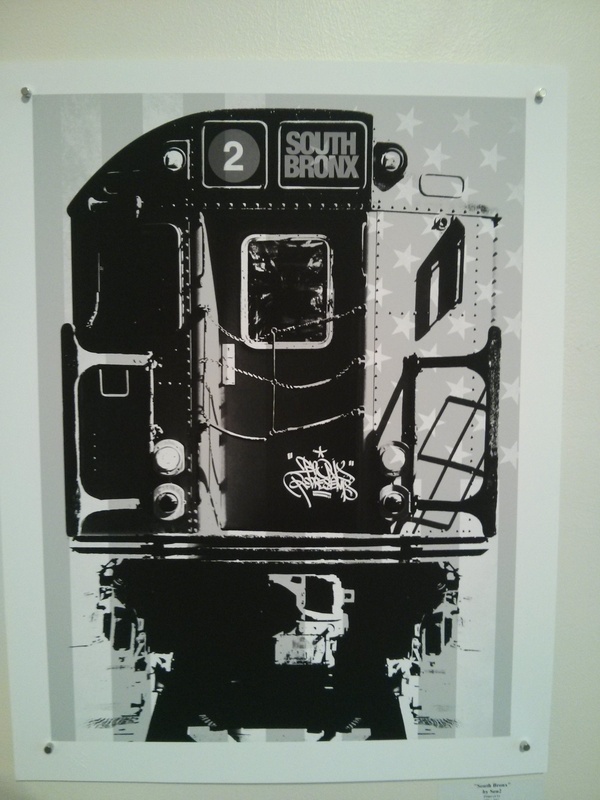 The artist is originally from Puerto Rico and he got to see NY during the glory days of the ’80s. 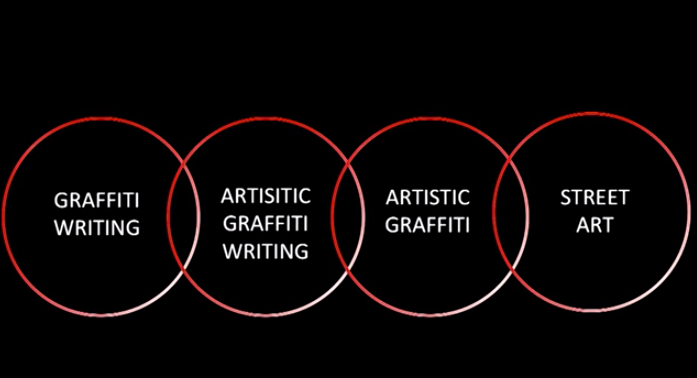 That exposure to the graffiti world led him to the success he’s found today. Besides being an awesome artist, he’s worked with famous people like Missy Elliot and Nas. It’s official. I’m leaving Los Angeles. A part of me still doesn’t quite believe it but if all goes well come August I will be in the crazy, colorful city that is San Francisco. I visited during the weekend and didn’t quite keep an eye out for street art but a couple of pieces found me. 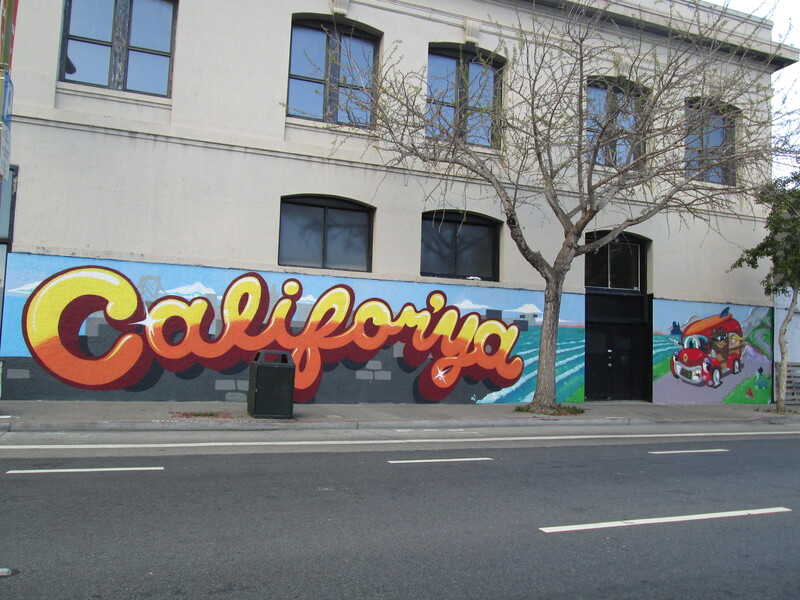 I’m interested in the difference between the art scenes of LA and SF — especially the street and public art scenes. I’m excited to find out. I have high standard for you, San Francisco! On another note, I’m getting quite addicted to traveling and seeing new places. So hopefully this blog will grow to show even MORE places that make the world feel like a canvas.